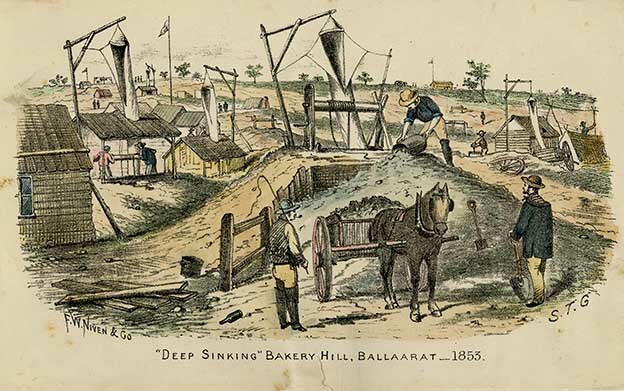 Samuel Thomas Gill, Deep Sinking, Bakery Hill, Ballarat - 1853, handcoloured lithograph. Arthur Wellesley Arnold was born in Bristol, England in 1835. He arrived at Port Phillip on the clipper Try on 12 January 1853. He married Martha Elizabeth Marshall on 3 July 1856 in Ballarat. The marriage took place at St Paul's schoolhouse on Bakery Hill. Elizabeth Marshall was born c1838 in Bath, Somerset. Arnold died at Echuca on 28 June 1911 and was buried at Echuca Cemetery. Arnold participated in theatrical productions at Ballarat and later at Avoca as an actor. He had been performing at the Red Hill Theatre. Arthur Arnold was lodging at Frank Carey’s restaurant at the time of the Eureka Stockade. Arnold had been in the Eureka Stockade on the afternoon of 2 December 1854, and was said to be one of James McGill’s Revolver Corps. At that time he was a member of the theatrical profession at Mrs Sarah Hanmer’s Theatre on Red Hill. He attended to injured and deceased miners after the battle. He was among those who tried to take the pikeman's body away, but each time they removed the Pikeman's Dog from the cart, it returned to sit with its master. After Eureka Arnold continued to mine in various places, including Maryborough, Lamplough, Avoca, and Echuca. He continued gold mining mainly in the Avoca / Lamplough area after Eureka. ***He participated in theatrical productions at Ballarat and later Avoca. In 1904 Arnold was living at Avoca, and attended the 50th anniversary celebrations of the Eureka battle. His reminiscences are told in the book Eureka Reminiscences. Arthur and Martha Arnold had twelve children. The golden wedding of Mr. and Mrs. Arthur W. Arnold of Avoca (Victoria), was celebrated on Tuesday. They have resided at Avoca since 1865. They were married at Ballarat by the Rev. J. Potter (afterwards canon) in 1856, and they have 27 descendants. Mr. Arnold was in Ballarat during the Eureka riots, and assisted in removing the dead and wounded from the field. Both he and Mrs. Arnold were members of the late G. V. Brooke's company when that celebrated actor opened the theatre at the Lamplough goldfield, then a canvas town of 40,000 inhabitants, now in almost deserted, mining centre. Robert Rede and the Riot Act from The Revolt at Eureka’ by R. Wenban. Schools Publishing House, 1959. Samuel Thomas Gill, Dangerously Suspicious, c1852, watercolour and gum arabic on paper. Sir,-As one of those who was present, and took part in the slurring events which led to the final catastrophe at the Stockade, I would like to relate my experience, more particularly as I note that au old "camarade de theatre” whom I note have never had the pleasure of meeting since those days, viz., A. W. Arnold, has been writing his experience. I was also a member of Mrs Hanmer's company of the Adelphi Theatre, Red Hill. I thought I would be the only one alive now who could give a graphic and correct statement of those events, because, although I knew that there would be older men alive yet who were there, still they had not the opportunities which Arnold and myself had to note events. We were both young. I was the youngest of the lot; but even then I wrote theatrical notices and paragraphs for the ‘‘Times," conducted by Mr Seekamp. The statements made by Arnold are the exact facts as they happened that morning. I came to Ballarat under engagement to Mr Tom Hetherington, then the best known man in Ballarat. I think Mr Oddie must remember him. He erected the first Theatre Royal, Ballarat, on the Gravel Pits, somewhere opposite Golden Point. I engaged under the “nom de theatre" of Frazer, taking it from a well known London actor, who had given me some instructions, and it was by that name I was known to Arnold and the rest of the company. The company I came up with comprised E. F. Strickland (a great comedian of the day), Musgrave (who made his mark subsequently as an old man actor), Percy (low comedian). Haffe (scene painter, afterwards a principal scene painter in the Melbourne theatres), Villiers, and myself. The ladies were Mrs Charles Forrest and Miss Villiers. Mrs Hetherington (formerly a London actress) was the leading lady; and White and Moore also were a part of the company. After playing a season the theatre had to be removed, as it was in danger of being swamped out by the baling from the Gravel Pits shafts, and was closed. Strickland and myself then engaged with Mrs Hanmer. The first play we took, part in was “The Honey moon—Strickland Duke Aranza, myself Rolando. The other diameters were fill ed by Mrs Hanmer's company, which comprised Harry Jackson (afterwards & great London low comedian), J. James, Graham, Hollyoak. Salone, and Arnold Mrs Hanmer (leading lady). Miss Hanmer, and Miss Stevens. I mention these names because it will revive pleasant memorial in your correspondent, Arnold, and those who may have known these times, and hence excusable at this junc ture. And, moreover, one—Hollyoak— took a prominent part in the stump ora tory of the day, with Lalor, Basson Humffray, and Black. And now I will proceed to speak of some of the events, and refer to mattens which may not have yet appeared on record. The Bentley and Scobie affair, as is well known, caus ed a disturbance and disaffection among the diggers; but this, although helping towards the emeute, was not the cause of the riot. The cause was the licence hunting by the troopers and cadets. (I note some of your correspondents call them police—there were no police.) 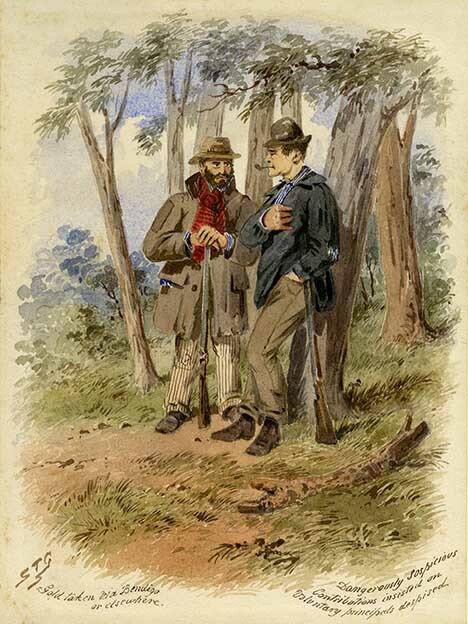 The only other work the troopers had was to scour for bushrangers. There were a great many Americans and Canadians (hence Canadian. Gully) in Ballarat at the time, and coming fresh from Cali fornia were inclined to a little Lynch law, and Bentley’s affair excited them, and they were the principal movers in bring ing justice home to Bentley. They join ed strongly in the opposition towards the license hunting, and the Irishmen, at the Eureka, ever ready for a little excitement, came to the front, with Lalor as their stump leader, Lalor being a fluent speak er, although then he spoke with very strong brogue. There were Kennedy and Ross, Scotchmen, and Hollyoak and Humffray. Verne, a Dane, had good English, and he, too, spoke occasionally, but the man who stood head and should ders above them all was an Italian, known as "the lemonade man"—he sold lemonade—Raffaelo. He was a man of high culture and refinement, could speak almost any language, had seen military service, a first-classs billiard player, and a great chess player. This was his favorite pastime. He lodged at the Duchess of Kent hotel, on ‘the Gum Tree Flat, and I often played chess with him, but, though a good player, I had no chance, as he could play blindfolded against three or four competitors at once. I mention; this to show what kind of man he was, and will refer to him later on. 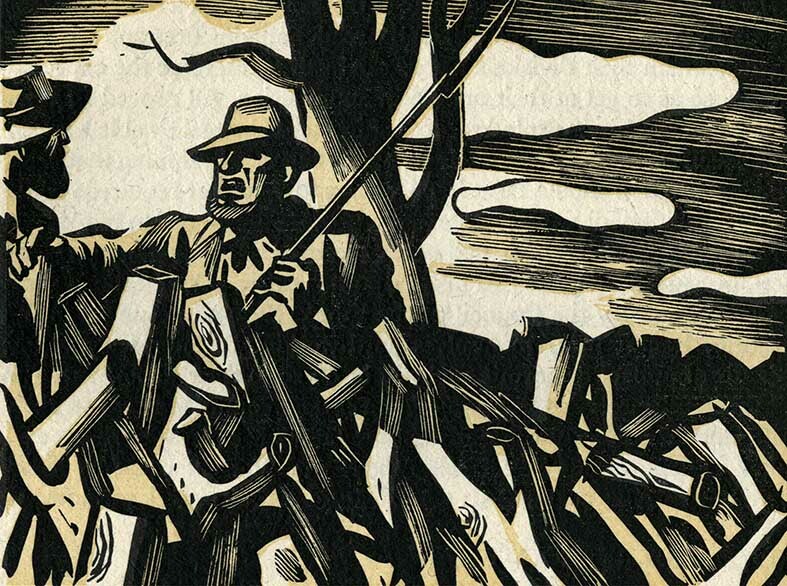 The meetings of the diggers, held chiefly on Bakery Hill, caused some alarm to the authorities, and when the troopers came out on their license hunting the diggers, instead of, as was their wont, running and hiding in holes, by a preconorted plan faced the troopers and commissioner in thousands, and defied them. They were unarmed, save with pikes and shovels. Seeing how, matters stood the commissioner returned to camp and shortly after Sir Chas. Hotham sent a despatch, ordering martial law to be proclaimed and the Riot Act read. Several deputations were sent to the com missioner, the diggers desiring to avoid bloodshed, and asking the authorities to reduce the license fee and to collect it, not by armed force, but by civic proceedings. Sir Charles Hotham, who was a very stubborn-headed man and a naval martinet, would listen to nothing, and orders were given to suppress the rising, and he also prepared to send reinforcements of soldiers and blue jackets from Melbourne. At the appointed time for reading the Riot Act the diggerss assembl ed in great force on the east end of the bridge (now known as Bridge street). They were armed with revolvers then. The Riot Act was read on the west end of the bridge, and Lalor, Verne, the Italian, and myself were in the front rank, listening quictly to the long rigmarole enforced on mayors or the chief in authority before a shot can be fired. As soon as the Act was read the diggers nearest to the bridge retired on either side and a circle was formed, they cheered lustily and it was arranged if the troopers charged to break the circle and retire behind the holes on either side, which were logged up some 20 feet high, and use them as forts to resist attack. Instead of the troopers charging, however, the Commissioner Rede, called Captain Wise to him, and they had a consultation. The soldiers were formed behind the troopers. The result of the consultation was not known at the time, but orders were given for all to retire to the camp. It was afterwards ascertained that Captain Wise, who was a humane man, did not care to fire on the diggers, nor did he care to trust the soldiers among the natural fortifications referred to. The retirement of the troops caused great jubilation among the diggers; in fact, too much so, and precipitated matters. Lalor got excited and summoned all to Bakery Hill, and mounting a stump addressed the im mense crowd, and told them that now the Riot Act had been read there was nothing left but open defiance. Kennedy mount ed the stump and told them all to “Burn their licenses." The diggers took the licenses out of their pockets, and set fire to them with matches. Verne addressed a few words; then the Italian mounted the stump and in broken English gave a Napoleonic speech, marked for brevity— “We dave talked long enough; let us act." This was received with tumultuous cheers, and Lalor then unfurled the Southern Cross flag, and called upon all to swear allegiance to the flag. The diggers knelt round the stump; Lalor looking an imposing figure as he waved the flag. For a short time the event was most impressive. There was not a murmur to be heard, and as they knelt complete silence reigned. On rising, cheers were given, and then the work of organisation commenced. Verne and the Italian under took the active command and drilling commenced. The Eureka Stockade was afterwards erected. 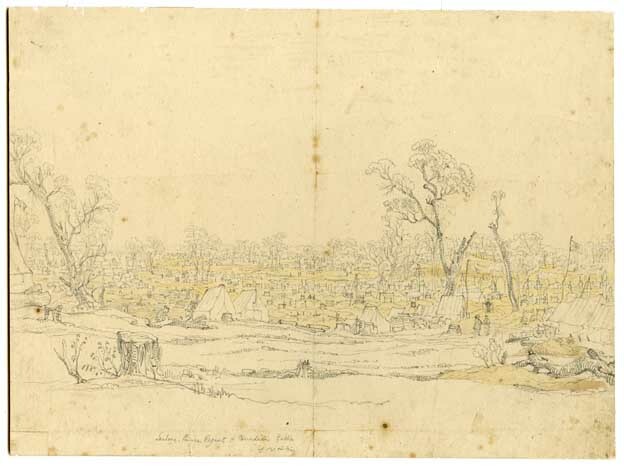 A few days after a contingent of diggers from Creswick arrived, numbering some thousands. They were for storming and at once taking the camp, as the force was very small in the camp, and the diggers were in thou sands. Lalor objected to this, and dismissed the Creswick diggers, as he considered they were strong enough for any thing in Ballarat, but would call on them as reserves if necessity required. Pikes were made by all the blacksmiths, and everything was very orderly conducted. A committee of public safety was formed to keep the peace in tho town (Ballarat East), with two or three secretaries. Hollyoak got me appointed-as one; my department was opposite the Star hotel (Irwin’s). My duty was to take a company of men 30 or 40 strong, and raid all the stores, in fact any place, for arms and ammunition, giving signed tickets to adherents to permit them to carry arms, and also gave receipts for the goods taken, (I never head if they were paid for or not afterwards, but I suppose the Government compensated.) M'Gill, Arnold and others had other departments, and all the property pistols, revolvers, swords, etc., of the theatre were taken possession of, mostly by the actors. Mrs Hanmer had a handsome sword, a heirloom, I believe, M'Gill used to head his men with this sword drawn, and was a conspicuous character, though it was said afterwards that he was a spy and gave information to the authorities of the weakness of the stockade. Several large meetings were held at different times, but no action was taken. At length Mr Tarleton, the American consul, came to Ballarat, and held a meeting of all Americans on the field in the United States Hotel, with closed doors. The outcome of this meeting was that an announcement was made next day that all Americans had seceded from the riot. Many of the Englishmen followed suit, and the whole brunt of the riot was left to the Irishmen, a few Scotchmen, and the foreigners, who would not submit. The falling away Americans weakened the cause. News arrived that the contingent of soldiers and bluejackets were on the road from Geelong. A hasty meeting was called at the stockade. There was a large number present, but it was the smallest meet ing yet held. I was present with my company. After long deliberations among the leaders, Lalor addressed those assembled, and ordered that a large force, as many as could be got together, should go to intercept the soldiers from Geelong. I was ordered with a large number of diggers to return to town and keep the peace there, and send any information necessary; while a small force with the leaders, were to stay at the Stockade, as no danger whatever was apprehended from the soldiers in the camp, who had been all this time so inactive. I went to the town, It was nearly dark before we broke up at Eureka; and as everything was quiet and peaceful I lay down in my bunk under a shop counter against the street. I had scarcely slept, when a loud knock came to the door and a voice called out, "Rise, rise; the Eureka Stockade is taken." I jump ed up (we slept with our clothes on those times), and made straight for the Stock ade. Fortunately I was unarmed; as I passed several troopers on my way, who took no notice of me. The sun was just rising as I came on to the Stockade. There were no soldiers, troopers, or armed diggers about; Everything was silent. Arnold, by his statement, was evidently aroused before I was. He lived nearer the Stockade. When I entered the Stockade, the first sight that met my view was the dead body of my old acquaintance the Italian. He had been most savagely bayoneted, and was almost unrecognisable able with bayonet wounds. I was told afterwords by those at the fight that he fought to the last, having managed to entrench himself in a place of vantage. He is supposed to have shot Captain Wise; and some other soldiers, so that when the soldiers got him they were savage at their captain being shot, and so bayonetted the valiant Italian- I noticed others also, stark and stiff, here and there, also cover ed with bayonet wounds. Some, who had been shot in or near tents, were burning, the soldiers having fired everything; and I also saw the man Arnold refers to, his legs roasting, while his little dog lay on his breast, and would allow no one to come near. The assault had been, made at break o’ day, and all was over before sunrise. After a while, as no troopers were about, friends and helpers came and re moved the dead. The wounded had been taken, to the Star Hotel. One correspondent says the London. Probably some might have been taken to the London, but Ross, as for as I can remember, died at the Star Hotel. I often had a talk over the affair with Irwin when I visited the Provincial, in Ballarat Lalor was wounded, and the subsequent events were as Arnold relates. The contingent came up a day or two after, and a very formidable one it was. I think there was one or more cannon, in charge of the blue- jackets. Peace was soon proclaimed, and business proceeded as before. The trial of those apprehended is a matter of history. The miner's right was the result of the insurrection, and all reasonable re forms asked by the people have invariably been acceded to ever since. So, disaster as it was, the rising of the diggers brought forth good fruit; and, like Arnold, though not present in body among the old stockaders at the celebration, I was in spirit. Living here in Casterton, so remote from a large centre, I could get no information, to the celebration, wrote to a firm I represent in Ballarat, but the principal was away, and the let ter mislaid. I telegraphed to Mr Bent for a pass, but he replied that all the passes were issued. However, I congratulate the old pioneers at having lived to see this day. I would probably not have known any of them, as I had no personal acquaintances out of the theatre and press circle, except the prominent men referred to, though I was well known in after years by the name of Frazer in the Smythesdale district by Mr Lynch, sen., surveyor, who surveyed many claims for me rear what is now Berringa. I am a Portuguese by birth and parentage, hence my name of D’Amaral, but was brought up and educated in England, principally in London, from the age of nine. I came to Melbourne in '52, in the ship Marlborough. Mr Graham Berry (afterwards Sir Graham) was a shipmate, and so was Mr Locke, sometime M.L.A. for Grenvilleshire. I also contributed articles and reports to “The Star" and “Courier" and “Grenville Advocate" during the seven ties, when the great Liberal agitation of that period was going on. Yours etc., F. D'AMARAL. Casterton, 3rd December, 1904. ↑ Barrier Miner, 14 July 1906. ↑ Ballarat Star, 6 December 1904. This page was last edited on 24 February 2019, at 05:54.